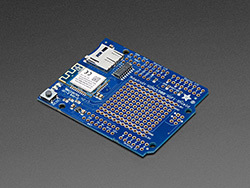 Connect your Arduino-compatible to the Internet with this WiFi shield that features the FCC-certified ATWINC1500 module from Atmel. This 802.11bgn-capable WiFi module is the best new thing for networking your devices, with SSL support and rock solid performance - running the adafruit.io MQTT demo for a full weekend straight with no hiccups (it would have run longer but we had to go to work, so we unplugged it). This module works with 802.11b, g, or n networks & supports WEP, WPA and WPA2 encryption. You can use it in Soft AP mode to create an ad-hoc network. For secure client connections, there is TLS 1.2 support! This version of the shield comes with a built in PCB antenna. Product Dimensions: 68.0mm x 53.0mm x 4.7mm / 2.7" x 2.1" x 0.2"